I am currently completing a Bachelor of Environmental Science (Marine Biology) at Deakin University in Warrnambool, Australia. 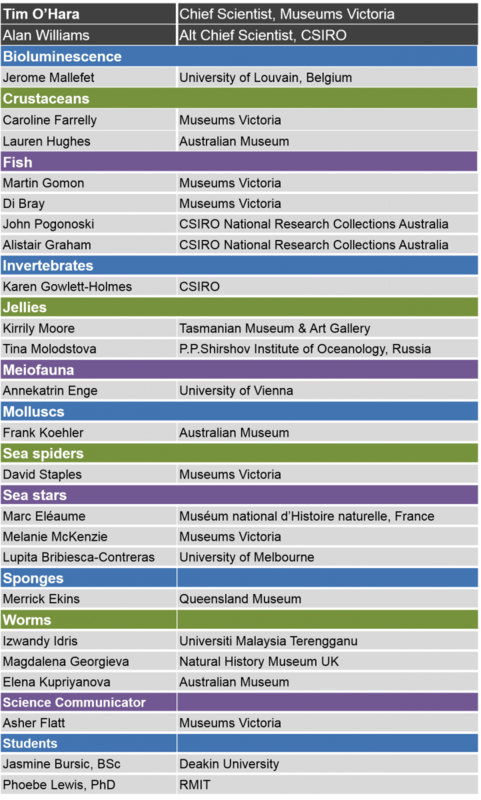 I recently completed an internship with Tim O'Hara at the Melbourne Museum working on identifying brittle stars. I'm incredibly lucky to have been given this opportunity, as the only undergraduate student on board. My role on the CSIRO RV Investigator is data entry. I'm looking forward to seeing the weird and wonderful creatures from the abyss. I am also very excited and fortunate to be working with amazing scientists from all over the world. I’m absolutely passionate about museum natural history collections and their value for research and education. They are world’s biological libraries – underpinning our knowledge and understanding of the world’s biodiversity and how it has changed over time. My job involves managing and developing natural history collections (mostly fishes and scientific artworks) so that people – including those not yet born – can answer all sorts of questions about our biodiversity now and into the future. I’m an editor and co-author of The Fishes of Australia’s Southern Coast, spend much of my time developing Fishes of Australia, a beautiful website on all fishes found in Australia’s vast EEZ, and coordinate the Redmap project for Victoria. I’m so excited to be on this voyage and can’t wait to see all the weird and wonderful critters we find. I am a PhD candidate at the University of Melbourne/Museums Victoria, and my current research focuses on macroevolution in brittle stars. I have worked with brittle stars since my undergraduate degree and I am lucky enough to be supervised by an authority on the field, Tim O´Hara. He is the chief scientist of this expedition, so I am here to process brittle stars and seastars. We are expecting to find new abyssal brittle stars to include in a phyogenomic study that will give us some insights on how these organisms invaded these extreme habitats. I am the Collection Manager of Sessile Marine Invertebrates at Queensland Museum. Sessile invertebrates include Porifera (sponges), Cnidaria (hard and soft corals, jellyfish, hydroids, anemones), Ascidians, Zooanthids, Hemichordata, Bryozoans (lace corals) and Brachiopods (lamp shells). I am responsible for the curation of more than 60 000 specimens, in between field surveys to Moreton Bay, the Great Barrier Reef, Torres Straits, and now the eastern abyss! I also work in remote locations conducting disease surveillance surveys and extracting coral fossils to understand palaeoecological changes in reef structure, and volunteer with the dugong health and population monitoring research program in Queensland. I am a scientist from the Department of Paleontology at the University of Vienna, Austria. The objects of my research are benthic foraminifera – microscopic small, single-celled organisms with a shell that live at the sea floor and are found in all marine environments. During my INDEEP-sponsored participation in this cruise I will collect foraminifera from sediment samples taken at different sites and depths. This will allow me to learn more the species distribution and diversity of living foraminifera in this deep-sea environment east of Australia. I expect to find many specimens of different species and forms of which some may have not been described before. 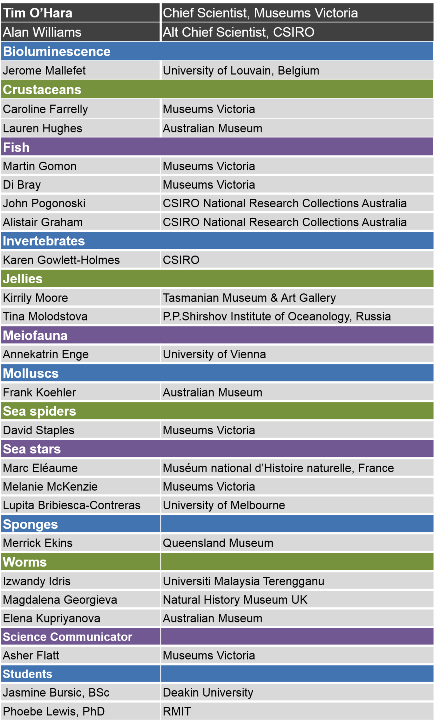 I am an honorary research scientist at Museums Victoria working in Marine Invertebrates. My role there is to identify many of the decapods (shrimp, crabs and lobsters) in the collection. I have worked mostly on deep sea material coming from the Tasmanian seamounts and the Great Australian Bight, but have identified specimens from all around Australia, including freshwater animals such as yabbies, crayfish and shrimp. Usually the material I work on is completely bleached from being preserved in alcohol. So this voyage gives me a rare opportunity to see live specimens in all their glorious colours and patterns. My role on the ship is obviously to identify as many of the decapods as I can, but given that the abyss along the east coast of Australia has never been sampled before, I am expecting to find many new records and species. I'm a science communicator onboard the RV Investigator, Voyage to the Abyss. I have a background in zoology and documentary filmmaking, but for this voyage my main tasks will be blogging and photography of life at, and under, the sea! I am a researcher at the Museum National d’Histoire Naturelle in Paris, I am also curator of Echinodermata collections. I am a taxonomist, meaning that I give names to animals, but also analyse their characters, morphological or molecular, to better understand their evolutionnary history. My research interests are focused on one group of animals, crinoids (sea lilies and feather stars). I mainly work on Antarctic species. However, to better understand the origin of Antarctic species, it is necessary to include species from outside the Southern Ocean, and broaden sampling efforts to all oceans. During this cruise we will be sampling unknown areas with a strong potential for new species that may constitute key taxa to our understanding of Crinoidea evolution. I am the Senior Curator in the Ichthyology section at Museums Victoria, a post I have held since 1979. I have collaborated with colleagues throughout Australia and internationally on a wide variety of studies from taxonomic revisions to environmental modelling, using fish distributions to act as surrogates for habitats. Although scientific in the main, my publications also range into the realms of semi-popular and utilitarian. In the past decade, I have focused on a number of deep water groups that have been largely ignored due to misperceptions of their low diversity and broad distributions. I am looking forward to contributing to the identification of abyssal fishes that are similarly poorly known. I am the Collection Manager at the Australian National Fish Collection at CSIRO in Hobart. The collection contains more than 150 000 specimens from more than 3000 Indo-Pacific species. I am responsible for managing and maintaining the collection so that Australian and international researchers can undertake their studies using our data, specimens, tissue samples, photographs and X-ray images. My duties during the voyage are to sort and record the details of the fish catch, identify the species, photograph, take muscle samples for genetic studies and then preserve the specimens for later study. I am a post-doctoral researcher at the Natural History Museum (NHM), London, UK. I recently completed my PhD, during which I investigated the evolutionary history of polychaete worms within some of the deep-sea's most remarkable habitats, those of hydrothermal vents and cold seeps. I studied the tubular homes which many polychaetes build, while currently I am helping to characterise the diversity of polychaetes within the central-eastern Pacific. Collecting polychaete worms will also be my role on board the RV Investigator, and in particular my team back at the NHM and I are interested in finding out whether there are similarities between the polychaetes which dwell in the deep waters around Australia and those of the central-eastern Pacific. I am very excited about this voyage as the waters of Australia sparked my passion for polychaetes and marine biology, and am also hoping we might also come across some whales during the expedition! I work at Universiti Malaysia Terengganu as one of junior academic staff in the Department of Marine Science. My interest is on polychaetes (marine worms) and I guess that is the main reason for me being accepted in this voyage. On this cruise, I will be sorting out the benthic specimens (mainly polychaetes) hauled from different gears including the 'Sherman' sled, Brenke sled and biological box corer. I would love to see lots of interesting benthos (seafloor creatures) that are different from shallow and tropical seas. At the same time, learning new techniques from other scientists. Born and raised in Berlin, I have been working as Research Scientist at the Australian Museum Sydney for the past nine years. I am particularly interested in the phylogeny and evolution of non-marine snails and use both molecular and morphological characters to address questions relating to the systematics, biogeography and evolution of snails. Lately, I have also been collaborating with colleagues from Museum Victoria in applying phylogenomic methods to resolve the systematic relationships among all snails. By participating in this cruise, I hope to be able to collect critical taxa for our on-going phylogenomic studies, but also to enhance my knowledge of marine molluscs in general. I’ve been volunteering for about four years in Marine Invertebrates at the Melbourne Museum with Melanie Mackenzie (also on the voyage), one of the Collection Managers. Some recent projects I have worked on at the Museum include DNA sampling of cephalopods for the Wildlife Biobank and sorting specimens from seabed surveys of the Browse Basin at the top of WA. I’m currently a PhD student at RMIT University studying the effects of plastic and persistent organic pollutants (POPs) in Antarctic seabirds. My role on the ship will be stable isotope sample collection (for diet analysis) and we will also be sampling for microplastics. I’m most looking forward to discovering all the interesting deep-sea creatures! I am a senior research scientist based at the Australian Museum Research Institute in Sydney who is lucky enough to be working on integrative systematics, phylogeny and life history of marine annelids (formerly known as polychaetes). My favourite group is the family Serpulidae that includes very unusual sedentary polychaetes that build calcareous tubes and inhabit hard substrates at all oceanic depths. My role on the ship will be obviously collecting, processing, and preserving worms, and I am looking forward to seeing alive many exciting worms that I have previously seen pickled in jars by somebody else. As a Collections Manager at Museums Victoria I’m usually working behind the scenes in laboratories and collections stores at Melbourne Museum. In my day job I help to manage the Marine Invertebrates collection – a huge ‘library of animals’ from historic and recent surveys that needs to be kept viable and accessible for ongoing morphological, genetic, and environmental research. As part of the ‘Marine Invertebrates team’ on this voyage, I will be working with all the ‘spineless’ (non-fish) critters in each catch, helping to sort, tissue sample, identify, record, photograph and preserve animals and related data for future study. I also have a special interest in holothuroids (sea cucumbers), so I can’t wait to see what kind of weird and wonderful sea cucumbers live at these abyssal depths! I’ll be looking down a microscope at their tiny identifying features, but I’ll also be keeping an eye on the footage from our underwater cameras to hopefully capture some of them moving, feeding, or even swimming in their natural habitats. And of course I’m looking forward to the comradery of ship life, excitement of new discoveries, and the shared knowledge and enthusiasm of specialist scientists and crew. Here’s hoping for clear skies, calm seas, and new answers to what lies beneath! I am a researcher at national science foundation FNRS in Belgium, working at the Catholic University of Louvain on bioluminescence: the capability of living organisms to produce visible light. Bioluminescence is widely distributed in marine taxa and plays essential roles for the species using it (from feeding to reproduction), but its significance in marine communities is still poorly understood. My goal is to understand how one living organism can produce light, for what purpose and with which cells or organ. I started to work as physiologist to understand bony fish bioluminescence control mechanisms and then extended my research to a pluridisciplinary approach (physiology, morphology, ethology, biochemistry) in ophiuroids (Echinoderms), pelagic worms and also sharks. I have been traveling around the world to collect brittlestars and other glowing organisms, thanks to many collaborators and marine stations. This RV Investigator expedition is a unique opportunity for me to get access to unknown fauna and I hope to encounter new luminous species in order to better understand why, how and where so many critters glow in the dark. I am the Invertebrate Collection Manager at the Tasmanian Museum and Art Gallery. Being a small museum means I get to work across all invertebrates from giant squid to ants and all the others you can think of. Generally I am responsible for registering and labeling specimens, storage, loans and some identifications but some days I find myself doing the most unexpected and diverse tasks! My specialty is the taxonomy of deep-sea soft corals (octocorals) - I'm still a beginner in this area and a trip like this will allow me to extend my knowledge and broaden my experience with taxa I haven't seen before. I'll be helping in the labs with the general bulk sort, getting the catch into manageable groups and if there is time into species units so I'll also get to see and assist with many other taxonomic groups. Sampling the abyss is such a daunting and exciting undertaking - I think the most interesting part of this trip is the unknown aspect of sampling at these depths. I am the Chief Scientist on the RV Investigator voyage to Australia's eastern abyss. Back at Museums Victoria, I am the Deputy Head of Marine Sciences and I use museum collections to answer large-scale questions about the distribution of seafloor animals around the globe. My taxonomic speciality is the Ophiurodea (brittle stars), a class of echinoderms that are a dominant component of the seafloor fauna. I am also a researcher and project leader with the Marine Biodiversity Hub, where I have produced maps of seafloor fauna and species richness for the Australian EEZ and neighbouring waters, providing an improved knowledge base for identifying, assessing and managing biodiversity in Commonwealth waters. A deeper understanding of the origins of selected Australian marine fauna can help to explain modern biogeographic patterns and assess the potential impacts of future change. I work at CSIRO’s Australian National Fish Collection in Hobart where my roles include fish identification, radiography (X-rays) for recognising new and previously known species, specimen curation and data capture for in-house and online databases. My main roles on the voyage are to identify and photograph fishes and collect and record data from the catches that allows tracking of specimens from ship to shore (such as names and sizes of species caught, accession numbers of specimens and where they will be sent). I am interested in the taxonomy and distributional ranges of Indo-Pacific fishes, but particularly Australian fishes, that number over 5000 species. My favourite taxonomic interest is marine eels that make up about five percent (about 250 species) of the Australian fish fauna. Marine eels occur from the shallow to depths of more than 4000 metres and I am hoping to find interesting records (and possibly new species) from this voyage. Click on image to view larger table.